Steps off: Saturday, October 8, 1:45 p.m. This march celebrates and promotes visibility of the Trans community. The march took place on the festival grounds and all Trans people and Trans Allies were there with positive banners and signs. We encouraged individuals to make and bring signs supportive of Trans issues. Please be advised that the Atlanta Police Department is responsible for enforcing all applicable state laws and local ordinances during Pride events. Such statutes may include, but are not limited to: public decency, alcohol, controlled substances, public safety and standard vehicle insurance requirements. Steps off: Saturday, October 8, 6:00 p.m. This march is dedicated to the empowerment of the women of Atlanta and beyond. The Dyke March, with its focus on women, unites to create an atmosphere of inclusion and community. The march is open to all women loving women (trans-inclusive) of any race, culture, orientation, ability, health, socioeconomic level, family structure, faith or age! This march is a time to demonstrate our commitment to nurture and build a new tomorrow, united for equality and justice. We called on all women of Atlanta and beyond to join us as we marched. Route: The Parade will step off from the Civic Center MARTA Station. The parade merges off Ralph McGill onto Peachtree Street and Travels north. It then turns east on to 10th Street and follows 10th Street to the Charles Allen Gate entrance of Piedmont Park, where the Parade officially ends. 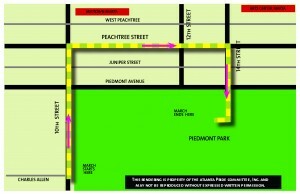 PLEASE NOTE: Due to permit concerns, the Atlanta Pride Parade will be reduced in size for 2016 (just like in 2015), so register early. Don’t delay because the parade always sells out and will close earlier this year.